In today’s fast moving world, there is a constant drive to get goods transported from one location to another efficiently, at low cost and on time, to satisfy the needs of both industry and consumers. 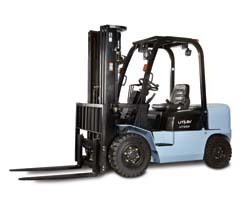 To meet these demands, the UTILEV range of affordable forklift trucks delivers reliable and cost-effective materials handling solutions for applications across many industries, particularly where users require equipment without advanced functionality or attachments. UTILEV trucks deliver a no-nonsense, uncomplicated approach to materials handling. The product range has been designed to be easy to operate and maintain, and is backed up by a standard warranty and comprehensive parts availability. The ergonomically designed operator compartment, with a familiar automotive layout means that operators will be able to work comfortably, preventing tiredness during handling operations. A range of standard features and options help to ensure that the truck is configured to the needs of the application. Thanks to the simplicity of the components and specification, servicing can be carried out, even when PCs, laptops or diagnostic tools are not available. UTILEV forklifts offer an ideal solution for operations where the truck is required to work for limited periods in the working week.